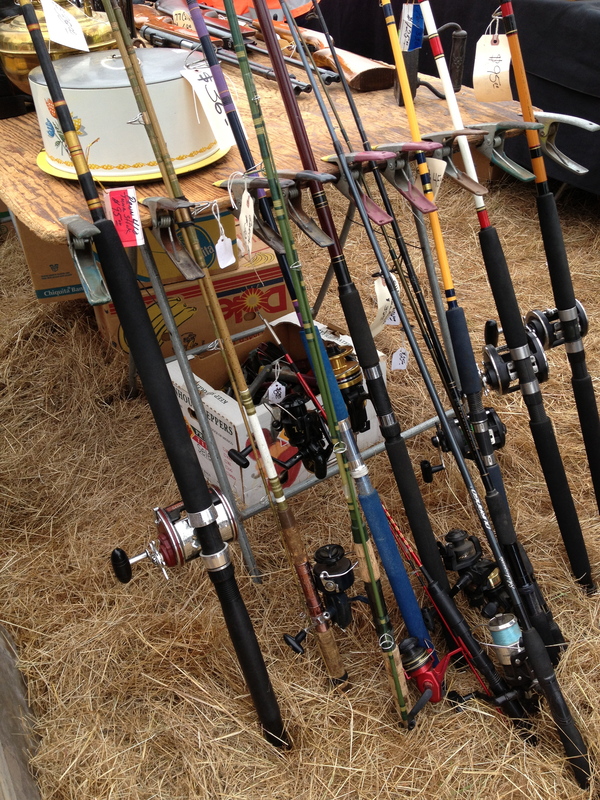 But this time, I must truly say, the Moss Landing Street Faire is totally my favorite to date. It is only a 25 minute drive from Carmel set in a coastal climate amidst the historic harbor town of Moss Landing. A favorite bay for watching blue and fin whales along with humpbacks, an occasional orca and plenty of dolphins. I arrive at almost 8am and directed to park in a field of hay. There’s so much mist that vendors are covering their wares with umbrellas and constantly swiping their metal items from the dampness. It feels so good as I walk on hay, careful not to twist an ankle along the way. The booths are filled with the coolest items from vintage farm containers repurposed as planters to antique sporting equipment to monochromatic spaces filled with soft pastel ribbons, rolls of burlap and glitter encrusted starfish. There’s this wonderful music filtering through the faire, where I come upon Oscar Reynolds, a master flutist and guitarist, entertaining the crowds. I take a photo of him and place a few dollars in his tip jar, now regretting not buying one of his tapes so his music could be enjoyed again. Moving through the crowds, dragging my cart behind, I never know what will move me. Somehow today I am attracted to pink. I find this darling shabby pink wooden child’s folding chair and a vintage pink White House gift box. The White House was a San Francisco landmark store, which I remember seeing as a little girl when I visited my grandma who lived there. Love all the pink California pottery, but it’s a popular color among pottery collectors, so prices are high and I cannot add these to my pink stuff today. After buying a beautiful crystal chandelier, my last pink purchase is a glass covered jar wrapped in a beautiful pink and blue brocade fabric with silk tassels and glass beads cascading from the lid. 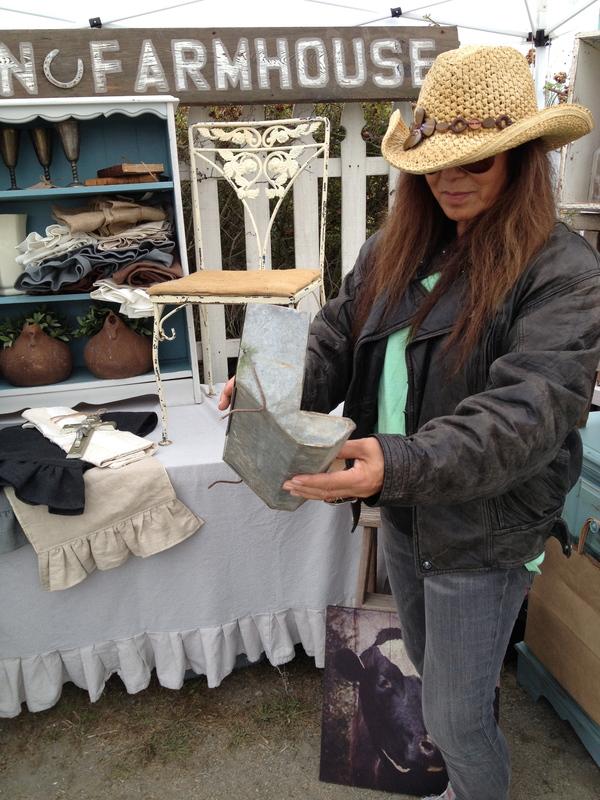 I spot a small iron stool in old pink paint priced at $40, but somehow I want it for only $15, so pass it by. As my pink phase has faded quickly, I now am seriously attracted to a pair of old wooden ski poles wrapped in leather and chipped paint. They would be great for a collector of lodge pieces, so they are now in my cart, poking everyone who passes me by. Adding to this new phase, I now find a heavy canvas circular bag with a thick rope handle, which resembles a feed bag, but is actually a tool tote. 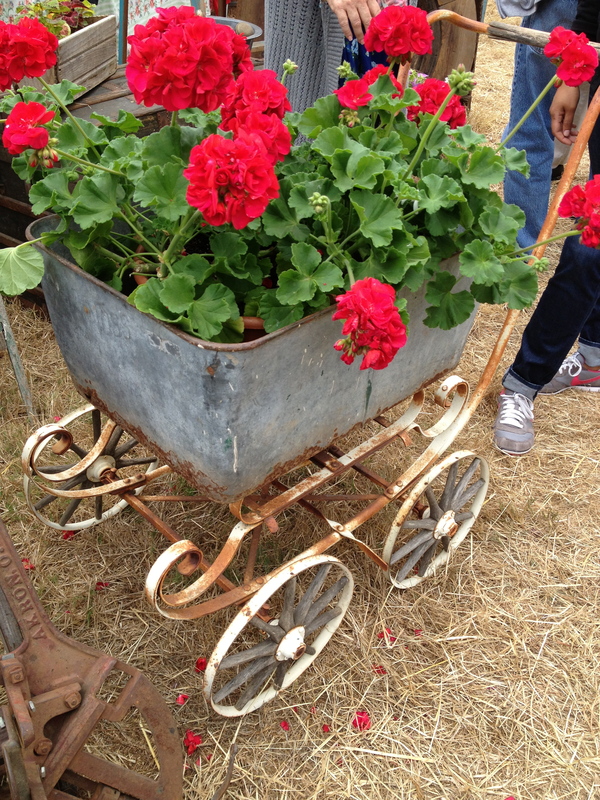 A leafy green plant would look great in this, so it is added to my cart. The food at outdoor faires can be so fragrant and enticing, and I rather like eating standing up over a trashcan, for some reason. There’s a smoking grill of roasted corn outside the calamari stand which is like being at a bonfire on the beach. I have to taste one of these. 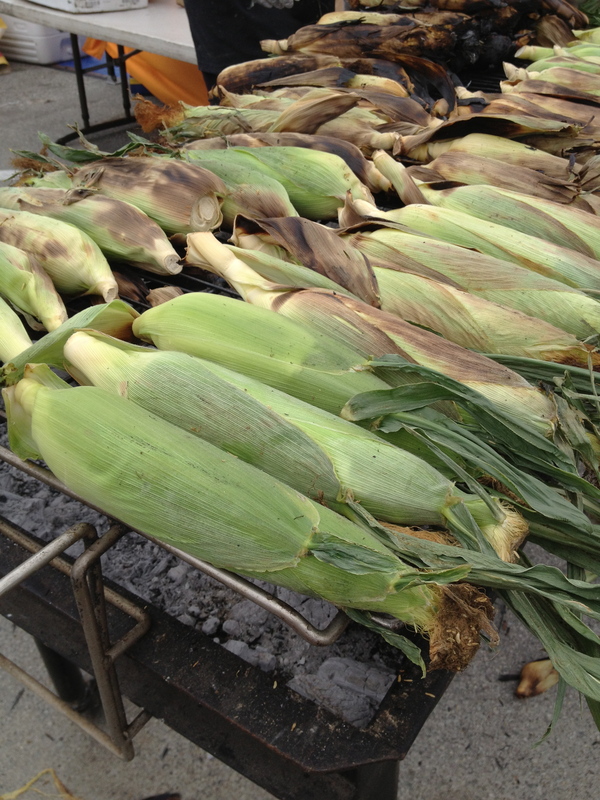 They were worth the long wait in line, as I peel back the husks, and the steaming corn tastes of charcoal and bursts in my mouth. Corn has never tasted this good. 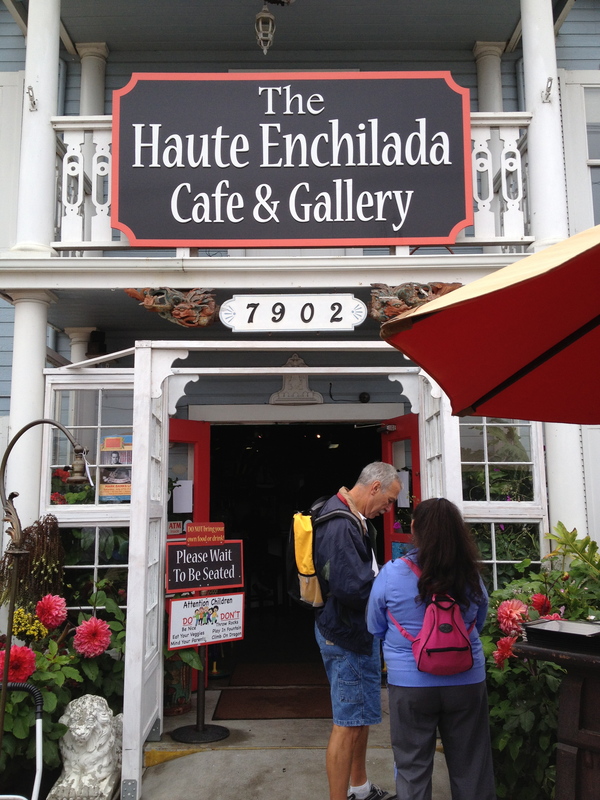 A glass of wine crosses my mind, as I wander down through the faire to discover the Haute Enchilada. 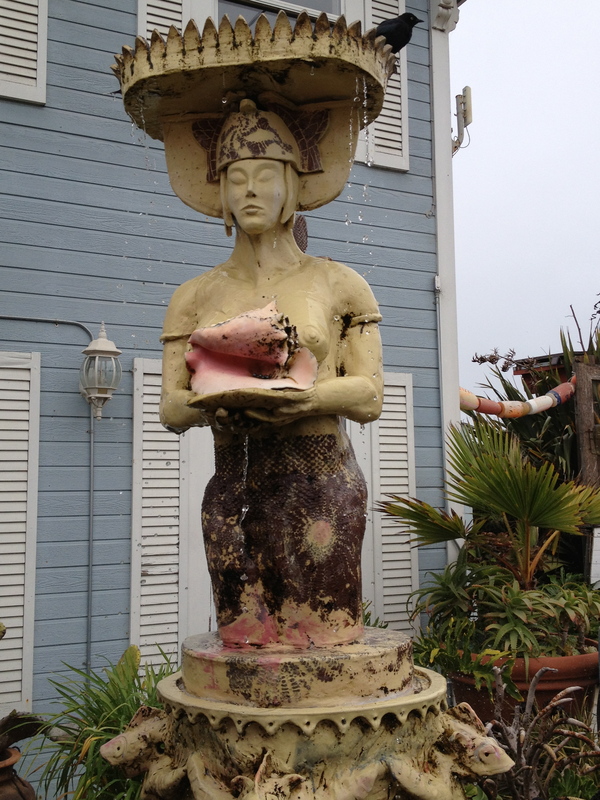 You love this restaurant immediately, as you first enter through an outdoor patio with red umbrellas set in a beautiful coastal garden with a gigantic stone sea maiden fountain, where the birds love to rest on her crown. Inside, the walls are covered in exquisite and vibrant Mexican art and they also have the only ATM in the area (a must at an outdoor antiques faire, as we all underestimate how much cash to bring). I am one who loves to sit at the bar. Even in a 5-star restaurant, I prefer dining at the bar, so here I am now sipping the most delicious, huge, freshly made Blackberry Margarita. I ask for the recipe, and the bartender says tequila, triple sec, sweet and sour mix, fresh lime juice, topped with mulled blackberries. I crave this drink every day now. Back on the streets of the faire, my eye is looking at everything leather. I negotiate on a vintage tooled leather black belt with gun holster for only $15. I remember seeing a beautifully patinaed leather briefcase on my way to the restaurant, so stop again to purchase it, as this nice vendor introduces me to a western author, B. M. Bower, whom I have never read, so purchase two of her books for my own collection. She also has a tooled leather saddle with the manufacturers leather label attached, which makes it quite desirable, and surprisingly takes my low offer. 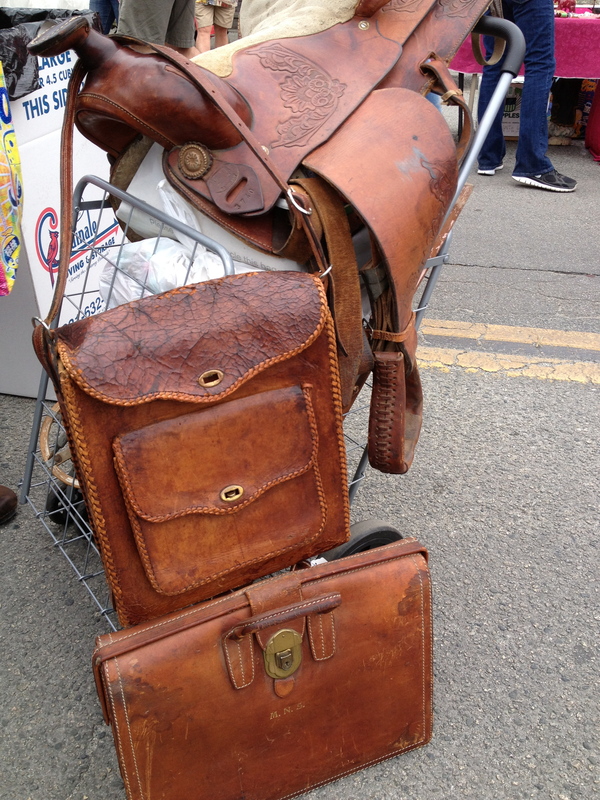 I now have a small cart filled with a gun holster, canvas tote, wooden chair and ski poles sticking out from a saddle that is teetering on its top, as I go struggling through the crowds looking alot like wagon train. My final purchase is from this grumpy couple but, unfortunately, it is they who have my “find of the day.” A leather messenger bag with a front pocket and a distressed flap, that looks like it stepped out of the pages of a Ralph Lauren fashion shoot in Montana. I totally only want to pay $75 for this bag, but they are firm on $110. I walk away. Stroll down about 3 booths, turn back around, signal to the guy $85. He grimaces “no,” as I peel out the $110 for the bag. It would probably sell for $1200 in New York. Loved Moss Landing. My last feat is to try to find my vehicle in the field, continue pushing my cart without falling into a gopher hole as I have my leather messenger bag crossed over my body and the crystals from the antique chandelier in my cart keep falling on the ground. Where’s that blackberry margarita when you need one.